KARACHI: International Freedom of Expression Exchange (IFEX) Executive Director Annie Game has urged Pakistan’s Prime Minister Nawaz Sharif to respond to UNESCO Director-General’s 2017 request that has sought information on the status of judicial inquiries into the killings of 55 journalists in Pakistan from 2006 to 2016. In a letter, Game also asked the Prime Minister to take measures to promote the safety of journalists in mainstream and online media, and to combat impunity. The Executive Director of IFEX, the global network working to promote and defend freedom of expression worldwide, said the UNESCO Director-General’s biennial report was a way for states to demonstrate their commitment to addressing crimes against journalists and media workers by providing detailed information on the steps being taken to achieve justice and end impunity. The report is expected to serve as a monitoring mechanism for tracking progress towards Sustainable Development Goal 16.10 on access to information and fundamental freedoms, which UN member states unanimously adopted. It has been observed that the report’s value would be further strengthened through the collection of information on good practices. 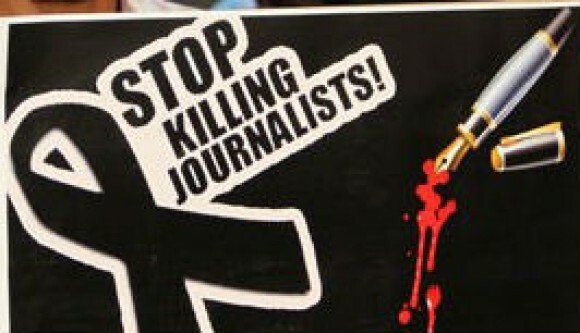 The IFEX Executive Director applauded Pakistan’s responses given in the years 2014 and 2016 on the Director-General’s request and asked him to further improve this trend of accountability by submitting a detailed and updated information on journalists killing cases to UNESCO, besides granting them permission to make it publicly available. She hoped that the Prime Minister would assist UNESCO in the collection of good practices by providing information on general safeguards implemented for the protection of journalists and also end impunity issue in Pakistan. She said responses by Pakistan would be included in the upcoming 2017 World Trends in Freedom of Expression and Media Development report and the 2018 report on the Safety of Journalists and the Danger of Impunity. Game informed Sharif that since 2006, over 800 journalists and media workers had been killed worldwide and in more than 90% of those cases, the perpetrators had gone unpunished and such type of extreme unchecked violence was the ultimate form of censorship that severely curtailed the flow of information necessary for a peaceful, prosperous and democratic society to flourish. “The culture of impunity that has developed around this issue only makes it more likely that such crimes will continue to occur. For this reason, the issue of impunity for killing of journalists is one of the greatest threats to freedom of expression and information worldwide,” she further said. The IFEX Executive Director urged the Prime Minister to ensure that Pakistan’s efforts are documented in the relevant reports and the government demonstrates accountability by making the submission to UNESCO before 30 May 2017. “In doing so, you will be helping to improve political will to address violence, building a global repertoire of best legal practices, and showing that attacks on freedom of expression in Pakistan will not be tolerated. We look forward to your response to this letter and to seeing updated information on the cases mentioned above made public in the relevant reports and on the UNESCO website,” Game concluded.